This lets people sign up others - for example a parent might join all their children as individual members, using their own account, or a team manager might want to join up renew and manage all the members of a team together. You might have some people who are members 'in real life' but who are not included in your online membership list You can add them yourself, or you can let them sign themselves up (they will be added to the membership list once you approve their request). 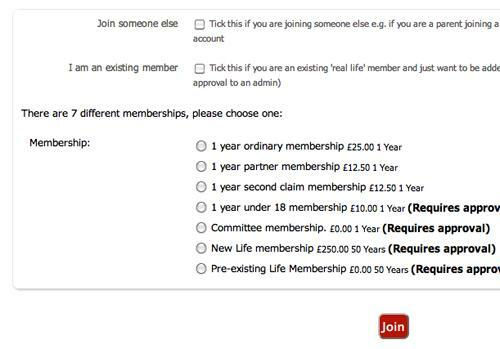 Members can choose which membership type is the right one - you can create as many of these as you like, with different fee amounts, membership forms and optionally requiring approval from an admin. If you only have a single membership type and don't enable existing membr sign up or joining someone else, new members automatically skip this page and are sent straight to your membership form.